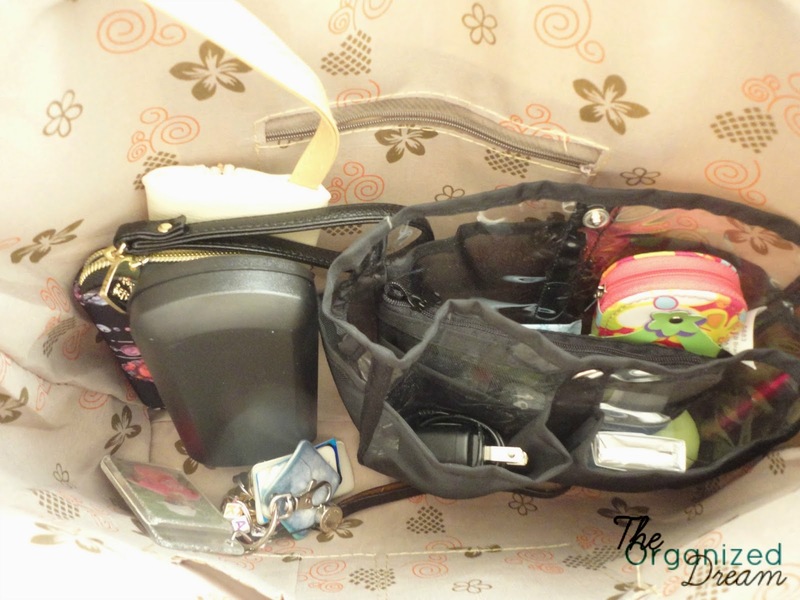 A Look Inside My Organized Handbag - Updated! Hello! Thanks for joining me today! I've recently reorganized my purse and thought it would be great to share it with you. Since my last purse post, I've gone a bit bigger and included a purse organizer. 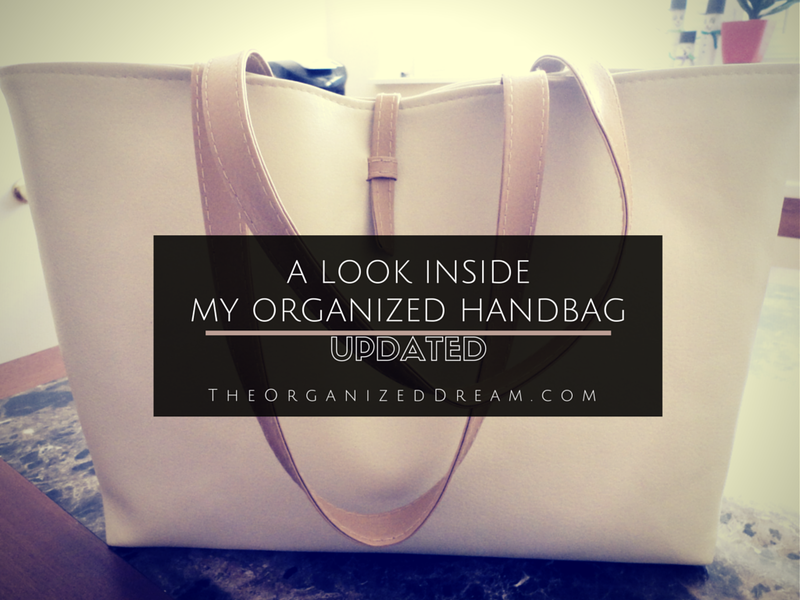 If you'd like to check out my other purse organizing post, Click Here. Here's a peak inside with everything in it's place. I know what you're probably thinking. Why do you have a purse organizer that's so small? Well, not only does it hold everything I need, but I switch out my purses so much this fits in the large and also the small ones! It's the perfect size. In the larger part, I keep a cell phone charger, gum, my EOS balm, a little manicure set my daughter gave me from her trip to the Cape with her grandparents and a smaller pouch for asprin, hand cream, sanitizer and lip gloss. These are my two favorite items. The hand cream, from Bath and Body Works, works really well to keep my hands from drying out and doesn't leave too much of a greasy feeling on my hands like other creams. 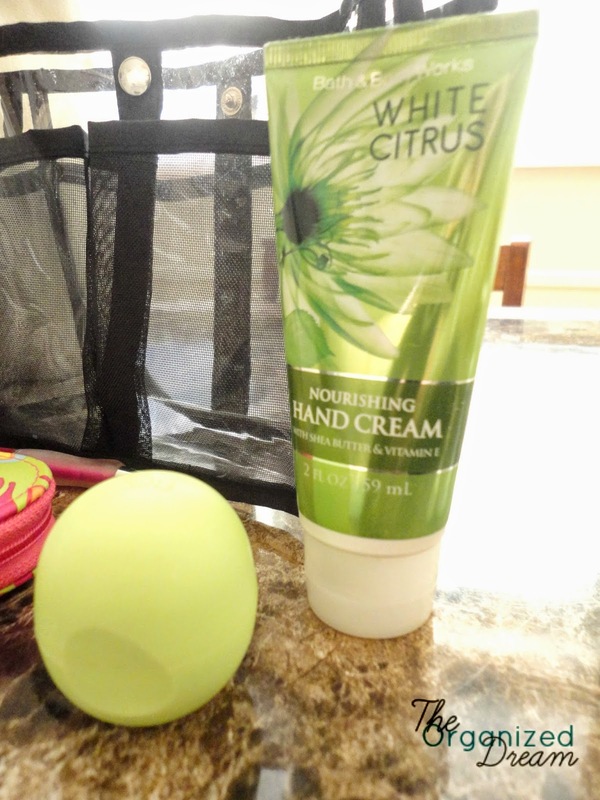 Of course, my EOS balm is second. I love this one. It smells amazing! I've learned to love wristlets even more and this one not only fits perfectly in my bag, but works great to grab and go when I don't need to bring everything else with me. 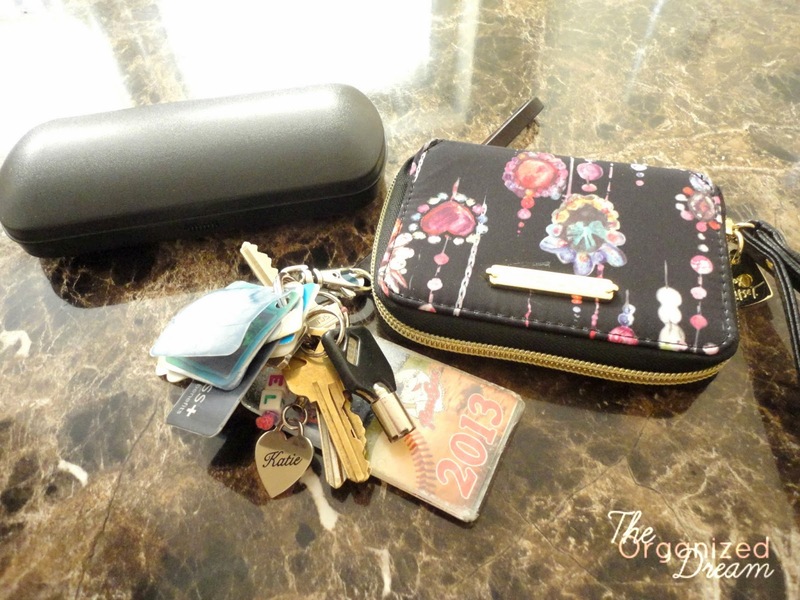 Along with that is my eye glass case and my keys. the only thing missing is my little red book that I like to carry with me to keep notes. You can see it in my previous post. And that's all she wrote! I love to keep my bag as organized as possible because it makes it so easy to go from bag to bag without forgetting anything. 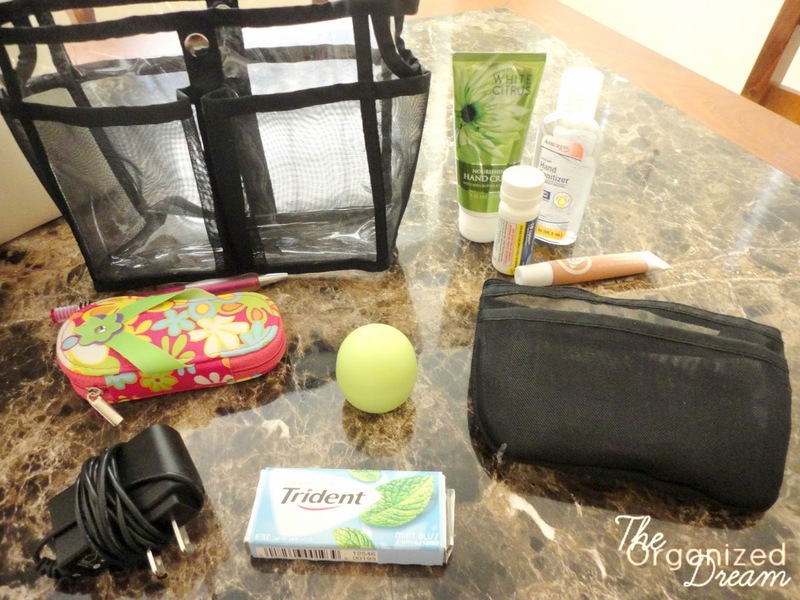 Do you organize your purse? What ways do you keep everything neat? That is an impressively organized purse! I have one of those organizers somewhere :). Thanks for the inspiration to find it. I never change out my purses because it's a pain to move everything. I forgot how much easier the little organizer helps that. My bag needs some kind of organisation. At the moment it is a black hole for "essentials", carrier bags and various items of tat my kids hand me. I lost my phone in there 4 times just this afternoon. I found 3 packets of wipes in there the other day, solved the mystery of why it was heavy! Oh if I could only be that organized! 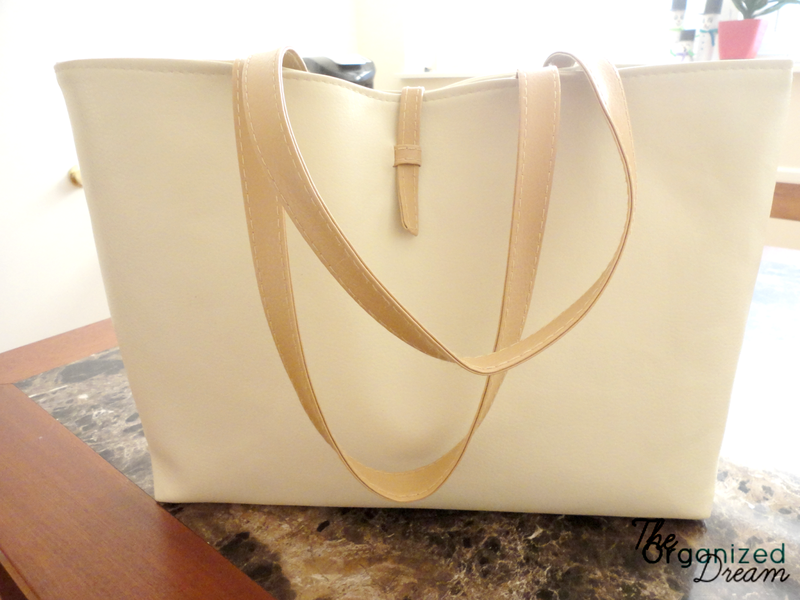 I am a lover of big purses, but am always losing things into the pits of the deep bag. I may have to try out an organizer! Thanks for sharing! 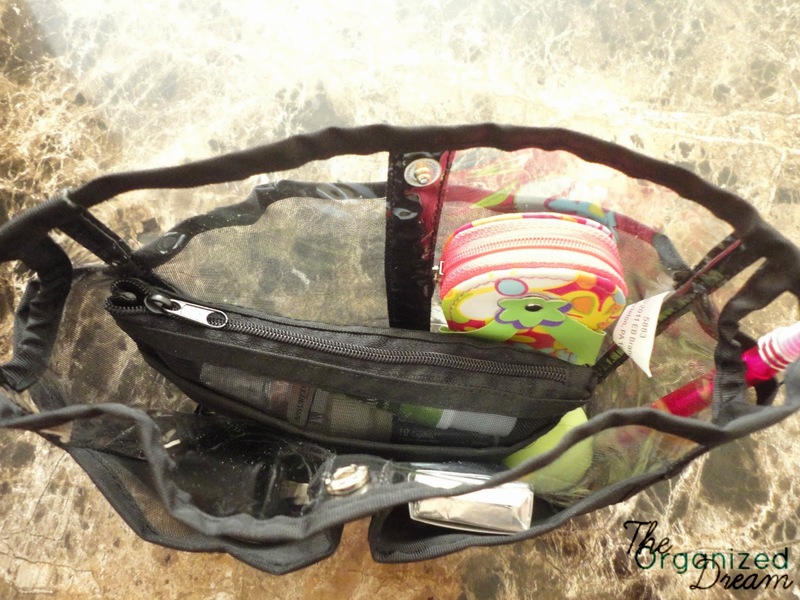 Great idea, keeping the purse organized is a never ending challenge! Thanks for sharing at Pin-Worthy Wednesday. Great idea! I need to get a purse organizer. Thanks for sharing at the party @DearCreatives Shared....Hope to see you again this week! I made two purse organizers for my divided purses. It was a ton of work, but I customized it to my stuff. I carry way too much stuff, but at least it is organized. Love your purse by the way! Thanks for sharing this and your yummy zesty potato recipe at What We Accomplished Wednesdays! Have a super week!